An embellished design using 30 modules. The individual pieces are somewhat time consuming, but the assembly process does not require pegs. 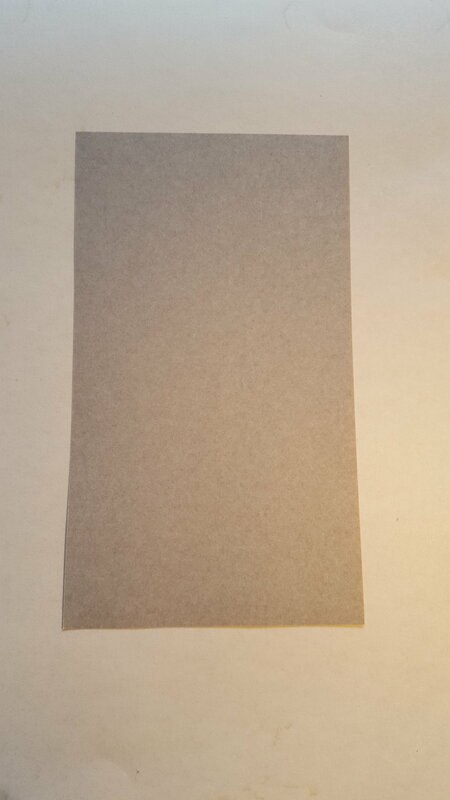 Start with a piece of paper in 1:√3 proportions. Fold the bottom left corner to the top right corner. Unfold and you should have one crease as shown. Fold the bottom right corner to the top left corner and unfold. 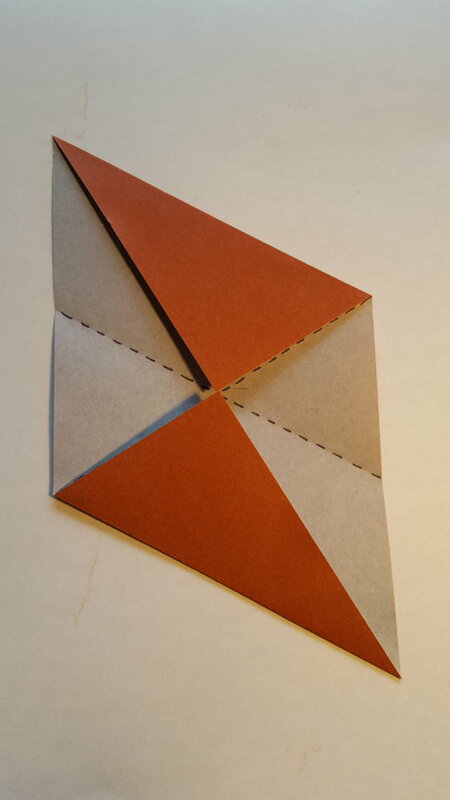 Fold the bottom right and top left corners to the centre. Turn over and rotate the paper. Fold the bottom right corner to the top left. 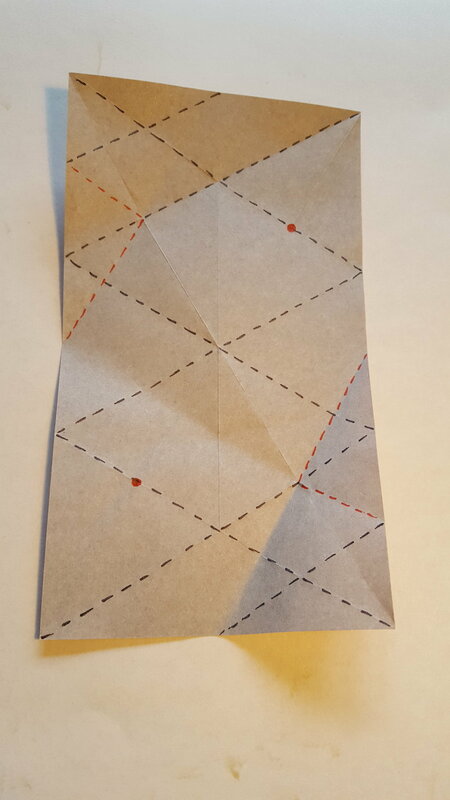 Unfold and then fold the bottom edge to meet the top edge. Unfold and you will have the following two creases. Also note the marked crease intersections on the top and bottom edge. Fold the bottom marked point to the top marked point. Turn over the paper and fully unfold. 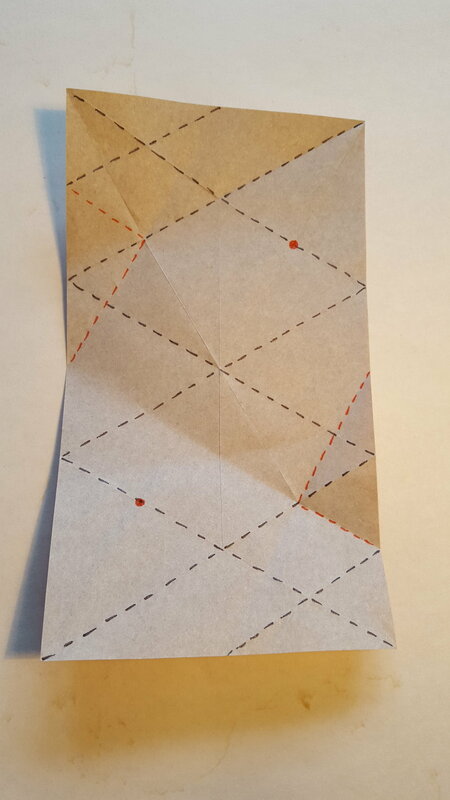 Fold the top left and bottom right corners in to meet the crease intersection shown. Unfold. Now is marked the red folds which need to be folded and the red dots show the intersection used. Bring the left bottom corner to the top red intersection, but only crease in the shown area. Bring the bottom right corner to the lower red intersection and again only crease the marked area. 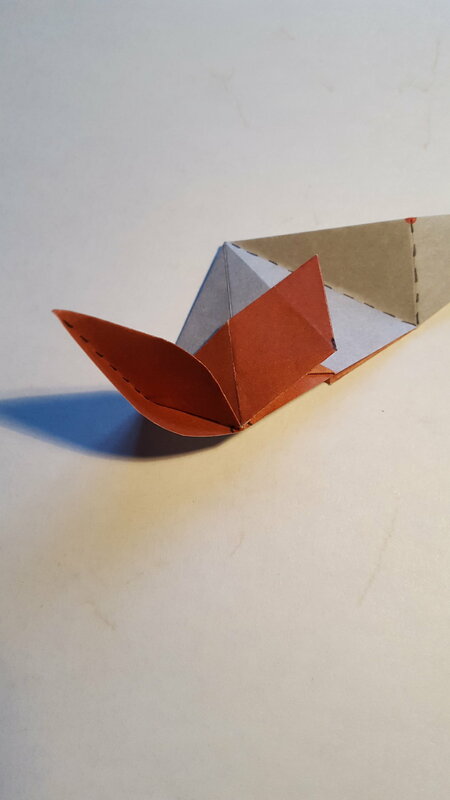 Unfold the paper and repeat steps 17 and 18 at the other end of the paper to fold the remaining two red creases. . 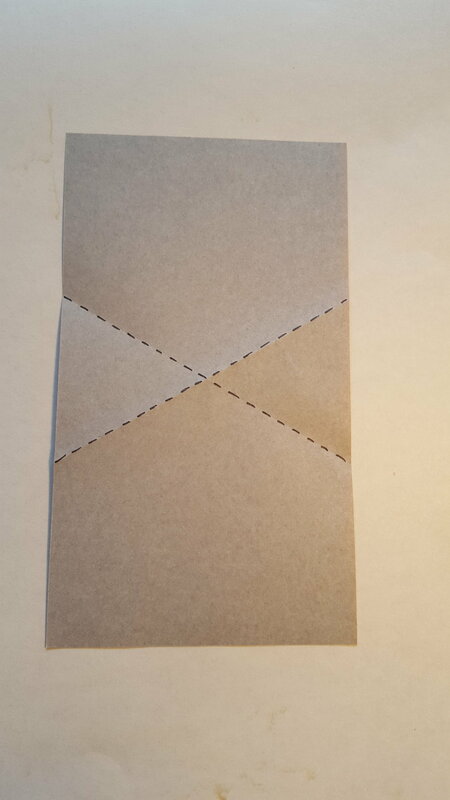 Fold the corners in again as shown. 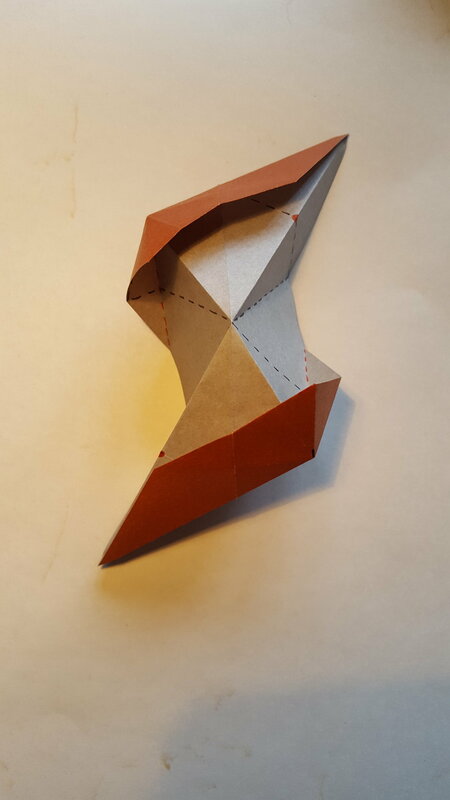 Gently shape the existing mountain folds allowing the red folds to take form. Keep shaping using the valley and mountain folds made previously. Flatten the module like so. Open the layers in the triangle just folded. Flatten this by aligning the tip with the right corner shown. 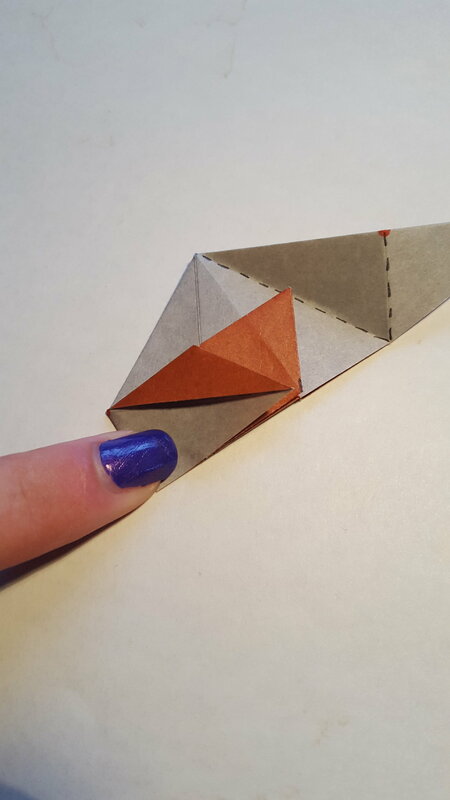 Fold the tip back to the left and hide the little grey triangle between the layers. Repeat from step 25 on the other side of the module and then it is done. This is how you connect the units. Make sure you insert the flap into the pocket correctly, it should not go into the bridge between the "flowers" or it will fall out easily (though on the last module this is a good idea for when the assembly becomes difficult). It needs to go into the left part which is enclosed. Assemble five units in this way to form a closed loop and then move to other "flowers" standard assembly geometry applies (5 unit flowers, 3 units round to make holes). You could use 12 units and have 4 units per flower instead if you prefer (the triangular holes will form an octahedron rather than an icosahedron).